Vocal ensemble OBesa Cantavit seeks to inspire listeners with the beauty and emotion of great choral music. OBesa repertoire features traditional & unusual a cappella works. 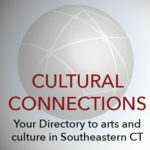 Based in Stonington Conn., founding artistic director Dara Blackstone. R. Douglass Rice is a painter and sculptor who lives in Stonington Ct on a renovated five acre farmhouse. He displays his outdoor sculptures over two of his acres. He exhibits widely in SE Conecticut in galleries and local museums. The Stonington Community Center (COMO) campus includes the main building, athletic fields, racquet facilities, a children's garden, playground, pond, duBois beach, Sandy Point beach, MakerSpace, pottery studio, and Thrift shop. It provides community events, youth/adult programming, award-winning childcare and community meeting space. The Stonington Historical Society was founded in 1895 and operates three historic museums/libraries: Old Lighthouse Museum (1840), Captain Nathaniel B. Palmer House (1851), and the Woolworth Library & Research Center. Our mission is to preserve, interpret, and celebrate the history of all of Stonington. Offering evening, afternoon, and week-long residency workshops in Iconography, Illumination, Calligraphy, Stained Glass, and Sacred Music among others. All Sacred Art Workshops feature highly skilled instructors and can be taken for college credit through Holy Apostles College in Cromwell, CT.